Learning to play an instrument helps teach children how to concentrate, focus and be patient. During a lesson, so many different skills are being learned. Students are essentially learning how to read an entirely new language. 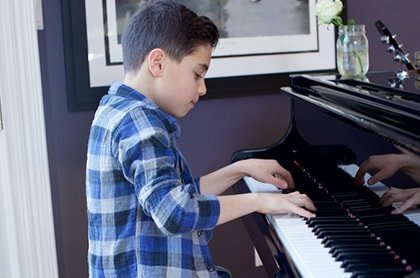 Children are learning to be present and in the moment and to focus on the music and the technique it takes to make the music.It’s a great way for kids to clear their minds of stress for an hour a week and concentrate on an amazing art. Learning an instrument boosts self-esteem.Music lessons offer an activity where children can learn to accept and utilize constructive criticism. Overcoming negative feedback with practice and accomplishing goals will help build confidence and self-esteem in students. Recitals and other performance opportunities will help build confidence in other non-musical areas like public speaking. Also, having a musical skill can help a child stand out from everyone else, further adding to her self-confidence. Would you rather your child be playing video games or learning a new song on their instrument? Having music to learn and practice puts those young brains to use!Your child can fight rainy day boredom by simply picking up their instrument. Plus, I’d choose to hear Billy Joel or Mozart being played than the dull drones of a video game. As parents, at the end of the day we hope we’ve instilled in our children that they can achieve anything they put their minds to, and learning an instrument is a major accomplishment for any student! Music To Your Home was founded by husband and wife team Tracy & Vincent Reina in 2003. Together, they’ve matched up thousands of clients with NYC’s best and brightest music teachers.